Another former activist from the Non-Stop Picket died this week. Ken Bodden, who during the time of the Non-Stop Picket worked politically under the name Ken Hughes, died on 20 October following a heart attack. Ken had experienced a number of health problems over the last year, but his death at the age of 63 was unexpected. He was well enough back in March to record an interview with Helen for our research. He has also been fondly remembered in many of the other interviews we have conducted. By way of an obituary, this blog post tells Ken’s story in his own words and those of his friends and comrades. He will be sorely missed. Ken was born in Panama in 1950 and lost his sight at a very early age as a result of retinoblastoma. In the context of Panamanian society at that time, he could have led a very limited life, but his father fought hard to give him other opportunities. At that time growing up in Panama any child with a disability really didn’t go to school because the government thinking was well you won’t get a job at the end so why waste money on educating you. And my father, much against the wishes of everybody else really, decided he wouldn’t put up with this, so at the age of five he sent me away to a boarding school in Kingston, Jamaica, where I did my education up until 14, at which time I came to Britain. (Interview with Ken Bodden, 6 March 2013). Ken recalled that, as a child, he had learnt about the civil rights movement in the United States and remembered hearing about the Sharpeville massacre in South Africa in 1960. It had a profound effect on him. He would later write a powerful song about Sharpeville that moved many on the Non-Stop Picket (see below). But it was during his time in boarding school in Britain that he first became politicized. When I came to school in England at that point I met other like-minded people and in particular some of the younger black people who’d grown up in Britain far longer than I had and they’d experienced a different kind of racism and oppression. (Interview with Ken Bodden, 6 March 2013). Initially, the main outlet for his politics came through his love of sport. Ken was passionate about creating opportunities for blind and partially sighted children to participate in organised sports. As the 1970s progressed, he also became increasingly involved in anti-racist campaigning. It was in that context that he first met members of the Revolutionary Communist Group, which he would later join and remain a supporter of for many years. The first I’d come across FRFI [Fight Racism, Fight Imperialism] and the RCG was on the big march in South East London when the party had been petrol bombed and they killed 13 people and, you know, I kind of had somebody to read the papers to me and I thought yeah, I mean at least it’s an organisation that realizes that racism’s actually integral to imperialism and imperialist rule in terms of yet another way of dividing up people. (Interview with Ken Bodden, 6 March 2013). Ken joined the City of London Anti-Apartheid Group in the early 1980s, just after the first Non-Stop Picket (for David Kitson) had ended. Memories differ, however, about exactly how he came to join City Group’s weekly pickets of the South African embassy at that time. Ken remembered that it was as a result of a chance encounter with Ruby Noorani (an early City Group activist) at a party. Others recall that Ken was already working alongside members of the RCG in the Stoke Newington Defence Campaign that arose out of the death, in police custody, of Colin Roach in Hackney, in 1983. Once the Non-Stop Picket began in April 1986, Ken became a regular fixture, both on his regular picket shifts and during the larger rallies there. Andy Higginbottom, City Group’s Secretary at the time, who had worked with Ken since the Stoke Newington Defence Campaign, remembered how they operated as a ‘double act’ at the Picket’s larger rallies. Ken was fantastic. I did a lot of stuff with Ken, I mean just looking back at the photos, I realise we were a bit of a double act really. He was like the entertainer and I was the control guy [chairing the rally]. He was extremely good. (Interview with Andy Higginbottom, 17 April 2012). At large rallies Ken would frequently lead the singing and chanting, engaging the crowd and getting them activated. He believed it was particularly important for black picketers to be seen to play a visible, leading role in anti-apartheid solidarity work. I mean I often helped to chair parts of these rallies and stuff like that, and to be honest with you that was something that I particularly wanted to do, because I wanted to show the Anti-Apartheid Movement and the wider world that City of London Anti-Apartheid Group had a clear presence of black people and are actively involved in playing a leading role in this scene; it wasn’t just about white people and what white people are doing in South Africa, it was a wider aspect of it. (Interview with Ken Bodden, 6 March 2013). He used these skills on ‘ordinary’ picket shifts too. I suppose because I had a loud voice and I did a lot of singing, took a lead in singing and such like, that and I wasn’t at all fazed by confronting the Boers and the people from the British Army as they were going past. So I remember standing there often with a bucket and then really waving it under people’s nose and imploring them to give money to support the picket, you know. Even if they wouldn’t stop and spend time with it, at least give some money, conscience money, just do something about apartheid. (Interview with Ken Bodden, 6 March 2013). Ken played a key role in the development of City Group Singers – a task that he understood as a political contribution to the group’s campaigning and the vitality of the Picket. City Group Singers were borne out of I suppose having learnt all these songs on the picket and having then started going out to various other rallies and marches and, you know, talks in universities or whatever. It was quite a nice thing actually to be able to go along there, introduce a couple of South African freedom songs, and if you like the City Group singers grew out of a group of people who were keen to learn a lot of the songs, more than just the ones that were sung regularly on the picket and use them on big rallies, on big events, because it was undoubtedly a good focal point for attracting people onto our contingent. (Interview with Ken Bodden, 6 March 2013). Many of the former picketers we have interviewed remember Ken in this role. You’d get people with a lot of talent, people like Ken and all that learning of the South African freedom songs, you know, for British people to do that. And that kept us going and certain moments when … that’s where the dynamic of the picket was positive, because you kind of geed each other up. (Interview with Ruby Noorani, 21 June 2013). How could you not be friends with Ken? Yeah Ken was fantastic, he was really inspirational. He’d get everybody going and also he’d obviously overcome … so many challenges himself and you could see that without him having to say that. And yet he never pandered, or asked to be pandered to, so he was quite an inspirational person to be around. You could learn a lot from being around Ken. And he was a good laugh as well. He was very funny, yeah. (Interview with Charine John, 4 June 2013). For Ken, these rallies were also exhilarating. He spoke passionately about the emotional impact of the sense of collectivity, connection and solidarity that they fostered. It was an absolute buzz to have that many people around in political unison campaigning for something, listening to people making clearly political speeches, listening to people talking about their own struggles against racism here in Britain, you know, listening to people talking about what people were doing in other parts of the world. (Interview with Ken Bodden, 6 March 2013). 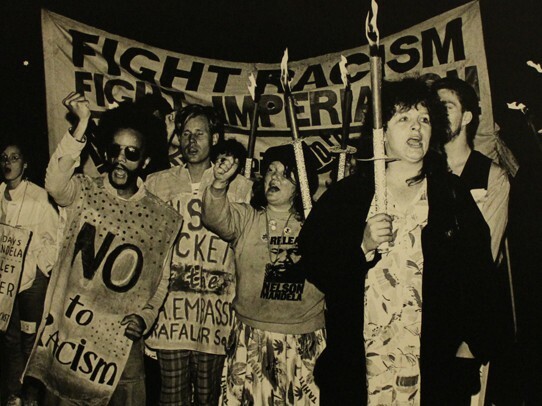 Many of his most memorable events on (or associated with) the Non-Stop Picket were those moments when people saw the connections between anti-racism in Britain and anti-imperialist struggles around the world. He spoke of participating in the Viraj Mendis Defence Campaign‘s march from Manchester to London and witnessing anti-apartheid campaigners sharing experiences and lessons with anti-deportation activists. 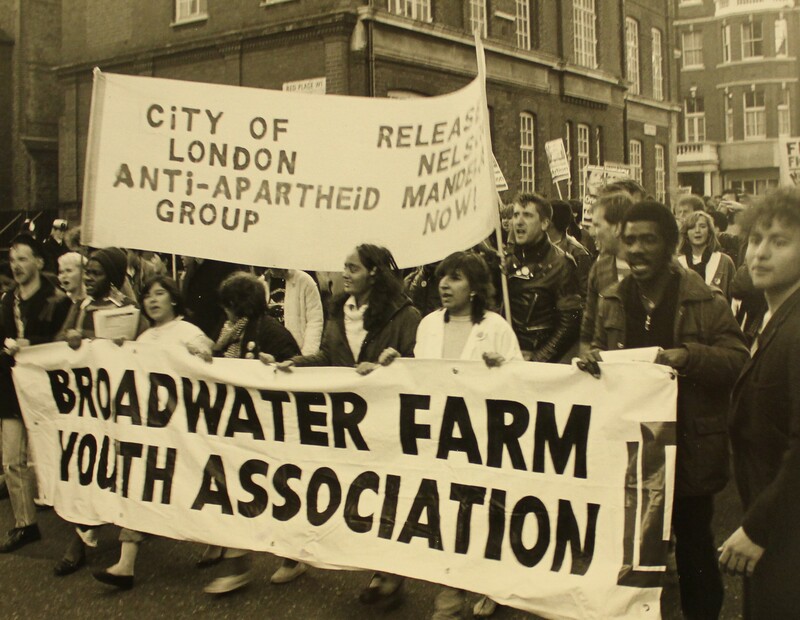 He was particularly proud of helping to mobilize a contingent from the Broadwater Farm Youth Association to join one of City Group’s demonstrations. 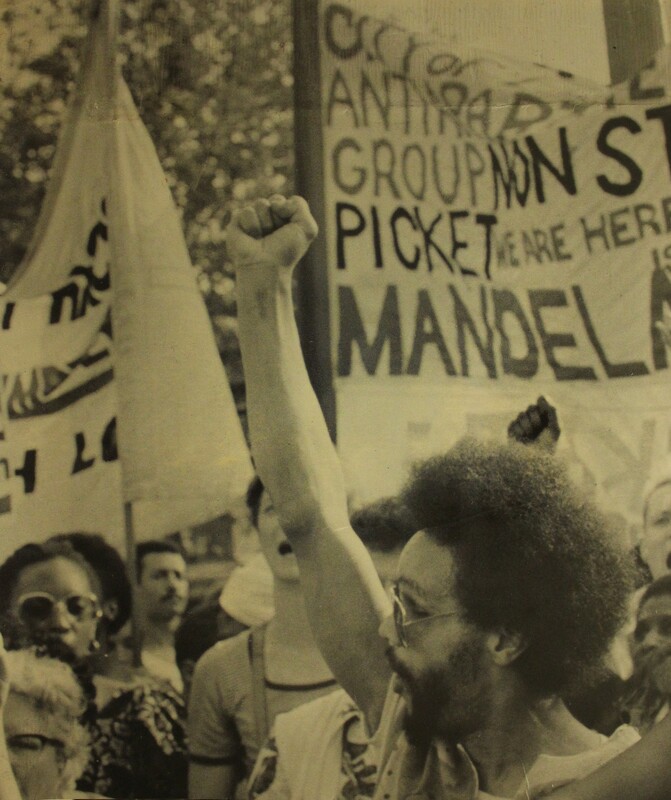 Ken remained politically active, through the RCG, for many years after the Non-Stop Picket ended. He continued to fight racism in Britain and mobilize international solidarity with people in Latin America and elsewhere. Fight all our lives to be free. We’ll rise up and break all your chains. This entry was posted in Interview material and tagged Broadwater Farm Youth Association, City Group Singers, City of London, Colin Roach, Ken Bodden, Ken Hughes, Non-Stop Picket, obituary, Revolutionary Communist Group, Sharpeville massacre, Stoke Newington Defence Campaign, Viraj Mendis Defence Campaign. Bookmark the permalink. I remember that Ken helped to compose and record a song about the mass escape of IRA prisoners from the H-Blocks in Long Kesh. He came to Ireland several times as part of the annual anti-internment weekend commemorations in August. I remember him making an impression with youth in Belfast as most of the black people they had met in their local areas were British soldiers who were seen as the enemy. Thankfully things have changed and the South Africans have had a major positive influence on the development of the peace process and policing in N.Ireland since the cease fire. Commiserations to Ken’s family and thanks for all he has done to make the world a better place.. I have only ever hear Ken play & sing as a part of his Group. I never know he had such an amazing history, of involvement in politics and areas of justice for all. So sad to hear that Ken has passed away. An amazing spirit and a wonderful voice:he will not be forgotten. Thanks for this. Ken tuned our ancient piano & kept it going. In fact he tuned it on 18th October so just before he died. I have just seen the obit in the guardian. He was an unusual, lovely and obviously talented man. We won’t forget him – my kids often ask after him. Condolences to his family and thanks for sharing more of his life with us. Ken was a kind and decent man. He had a lot to be angry about. But he remained a compassionate and gentle person. That is the mark of greatness.